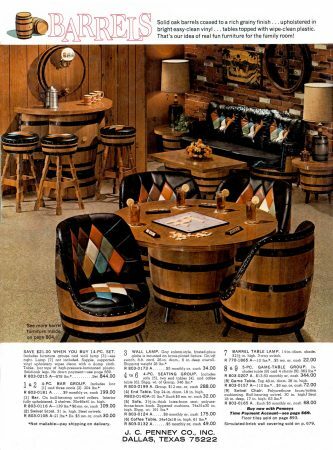 It’s a total mystery why barrels suddenly became a decorating trend in the late 1960s and early 1970s. But JC Penney was on top of it when they pictured this room on the back cover of their 1968 catalog. You’ve got barrel chairs, barrel tables (“wipe-clean plastic topped”), barrel lamps, and a barrel bar. This over-the-top style looks like an old Shakey’s pizza parlor. It’s the very very definition of rumpus room, where mom and dad and the kids could hang out in front of the color TV, throw darts, or play a rousing game of Scrabble. The whole thing is striving for some sort of retro vibe, but I’m not sure that the barrels or anything else in the room was authentic – even the walls are clad in veneer that merely looks like brick and which could be ordered on page 678. 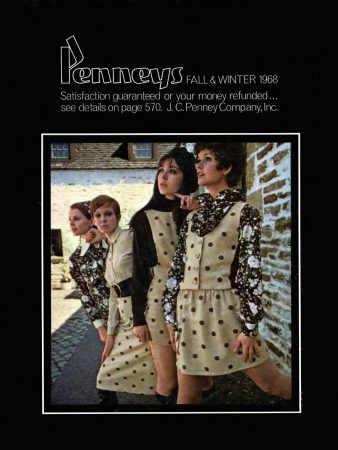 Meanwhile, as the rest of the family is drinking at the barrel bar, over on the front cover of the Penneys catalog, the youth of 1968 are out on the town, seemingly looking for something, staring somewhat uncertainly at the world they would inherit….